In the second in Penningtons Manches’ series of blogs for international athletes and their advisers, immigration expert, Hazar El-Chamaa, outlines the key legal points to consider when coming to compete in the UK. This comes in the wake of athletes being denied entry on arrival or facing delays for failing to take into account immigration requirements. Given the risks of adverse immigration history and reputational damage, it is important to get legal advice early on to make sure any issues are resolved well in advance of a scheduled event. Below we set out the key immigration and visa issues to be aware of. The information is relevant to both long-term stays (e.g. footballers staying to perform a five year contract) and shorter visits (e.g. tennis players staying for a few days/weeks to compete in a tournament). Do I need a visa before travelling to the UK? you are a non-visa national (e.g. USA) and entering as a visitor or under Tier 5 for a period of less than three months. See below for other requirements that must be met. In almost all other cases the answer would be YES and a visa would need to be obtained in your home country under the relevant route before travelling to the UK. Which route should I come in under? 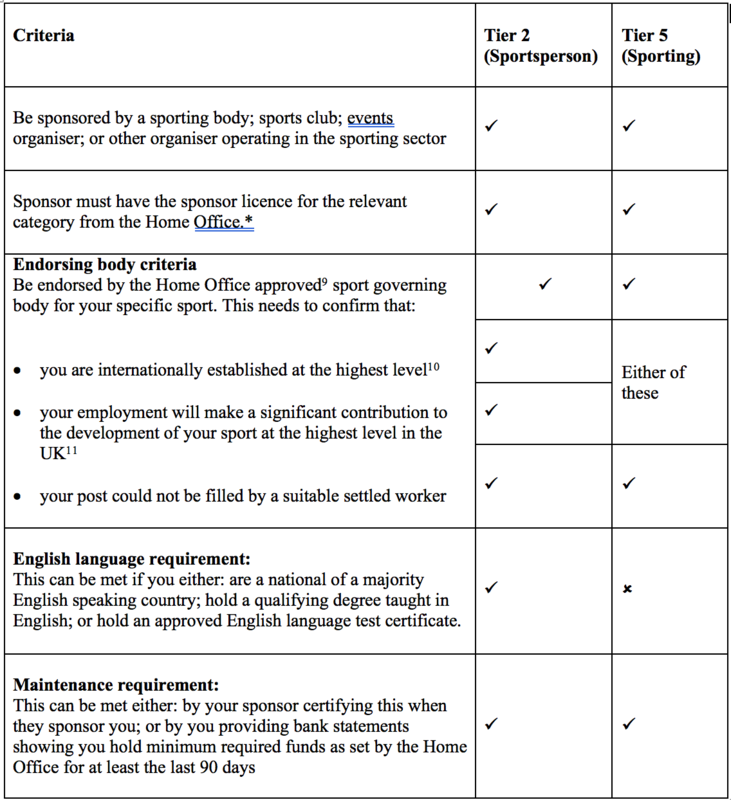 There are three possible relevant routes to the UK: Visitor; Tier 2 sportsperson; or Tier 5 temporary worker sporting sub-category. Choosing between them will depend on whether the activity you wish to undertake in the UK amounts to work (paid or unpaid) and the duration of your stay. Below we set out the relevant considerations for each route. join an amateur team or club to gain experience in a particular sport provided you are an “amateur” in that sport. You must not carry out any prohibited activity i.e. activity must not amount to work (paid or unpaid). Permitted Paid Engagement - This is a sub-category of the Visitor visa under which professional athletes can enter the UK to carry out an activity related to their profession and be paid. NB: The athlete’s personal or technical staff employed by them overseas can enter under the visitor route to support their activities provided they are attending the same event. This is applicable if the athlete is entering under either the standard or permitted paid engagement visitor route. These two routes are available to a professional athlete (and their staff) who will be coming to the UK to take up employment provided the criteria set out in the table below is met. Tier 2 sportsperson leads to settlement in the UK on completion of five years residence. Minimum salary thresholds must be met at that stage. this applies if you were previously sponsored under Tier 2 for more than three months and your proposed annual salary package will be less than £159,600. This means that you will not be able to return to the UK under Tier 2 until the 12 months have passed from when you were last in the UK. How far in advance should I make my application? You can apply a maximum of three months ahead of your anticipated start date in the UK. Yes if you are entering under Tier 2 or Tier 5 and provided any children are under 18. If entering as a visitor they will need to apply to enter as visitors in their own right. There are certain conditions imposed on your stay in the UK. You will not be able to rely on public funds or start up a business. Your family members will also not be able to rely on public funds. Your spouse/civil partner however is able to work but not as a doctor or dentist in training or a professional sportsperson. I don’t meet the requirements for these three routes, are there any alternatives? Your partner is a British/EEA or Swiss national: this can be your spouse or unmarried partner (if you have lived together for two years). If your partner is British there is a financial threshold and English language requirement that will need to be met which is set by the Home Office. Not only can rejections be damaging to future applications, (previous visa refusals will need to be declared on any subsequent visa applications) but the position may not be held open if you are not able to obtain your visa and enter the UK in time. For example, an athlete may be due to participate in Wimbledon or drive in the British Grand Prix but a visa refusal or failure to obtain a visa in time may result in them being unable to take part in the event. This blog is for your information only. Please always seek legal advice if you are uncertain about any of the points or steps. Although Switzerland is not part of the EU/EEA, Swiss nationals and their family members have the same free movement rights as nationals of EEA countries. “Amateur” is defined as a person who engages in a sport activity solely for personal enjoyment and is not seeking to derive a living from the activity. This includes a person playing or coaching in a charity game. “Professional Sportsperson” defined as someone, paid or unpaid, who is providing services as a sportsperson, playing or coaching in any capacity, at a professional or semi-professional level of sport; or at any level of sport if they derive/ have derived or seek to derive, a living from playing or coaching, unless they are doing so as an “Amateur”. Check the criteria of your sport governing body as above.